I don’t know about you but I seem to have a hard time with estimating how things are going to come out. I think things will be better than they really are and less worse than they really are. What about you, is this an issue for you? Things are never as good as they seem. You get a call that says you need to come into your doctor’s office for a biopsy. Your boss calls you into his office and tells you you’ve been laid off. A loved one dies suddenly. A loved one has a significant illness and you have to stop working to take care of them. You own a business and one of your employees just killed someone with a company car. These are all real things that can happen. Human beings are a positive bunch. We think that things are better than they are. This is called optimism bias, which means we think things are more successful and better than they really are. It’s something you need to be aware of. You make less money than you think. This is a major form of optimism bias. Have you ever had the experience that your month has way too many days left for the amount of money you have? This is easily explained. It’s because you think you make more money than you really do. This is a real problem with retirement planning. Too often we think that we have lots of money for retirement. You might get there and find that after a few years you have to go back to work. The reason is really quite simple; you thought the money you had was going to go farther than it really does. You spend more money than you think. This is the flip side of how much money you make. If you do accurately estimate how much money you make there is a good chance you underestimate how much money you spend. I know I’ve done this more than once in my life. I’ve even done it in businesses that I’ve run. In my own case I’ve put together business budgets and was able to forecast what our sales would be. Then there is this little surprise that comes along. The surprise is big enough that it’s caused me to go from having a profit to a loss. This was not a good day. The same could be true for you. You might find that you’ve under estimated how much it’s going to cost you for your retirement. You don’t want to find yourself in a position where you either have to throttle back your spending or go back to work. The solution here is a pretty simple one. You should do some scenario planning. For us scenario planning means putting together a financial plan and stress testing the plan. What happens if you lose your job? What happens if you have a health issue? What happens when you finally retire? Will you have enough money and not have to go back to work? All of these can be easily modeled out. Its part of what we call client facing financial planning. You provide us with your financial information, we build a model and together we try out different scenarios. 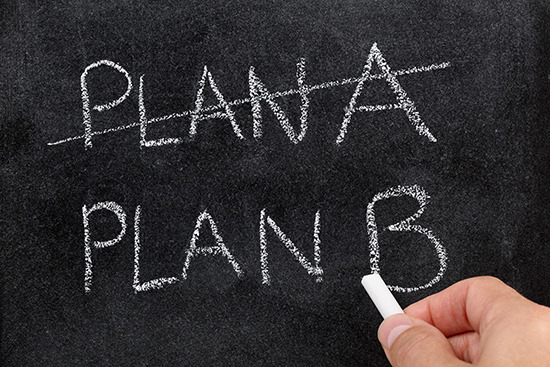 If the plan fails, you have a chance to do something about it. If all the plans work, then you get to keep on doing what you’ve been doing. You don’t want to have to change your plans after you’ve started retirement or sold your business. A little scenario planning can go a long ways in helping you avoid both problems. There is a warning: Scenario planning only shows you direction. It doesn’t guarantee a good result. It only gives an idea of what could happen. Having an idea is better than not having one at all. We have a special report on the basics of retirement planning. To get this report click on the button below.